It seems fitting that I write this on August 22th because not only is this my mother’s birthday, but it is also Willy DeVille’s birthday. Today he would have been 59. Instead on August 6, 2009 he succumbed to Pancreatic Cancer. Coming hot on the heels of Michael Jackson’s death I can say with no reservations that this one affected me much more. 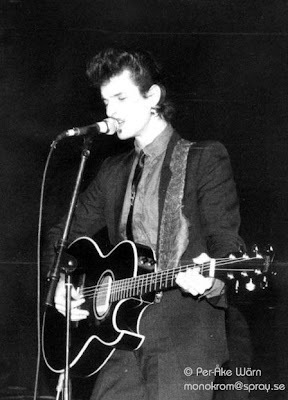 In 1978 I was fortunate to see him play live in Buffalo, N.Y. Mink DeVille played on the same bill with Elvis Costello & the Attractions and Nick Lowe & Rockpile. The night was magical all of the bands were amazing, however the brooding, dark, leader of the band Mink DeVille pulled you in and pushed you away at the same time. He made you want to hear more and challenged you to define what it was he was actually doing with the music. 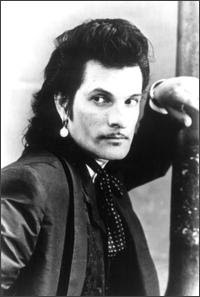 Although Mink DeVille was signed as a “Punk” band in the 70’s Willy’s range was so much fuller, he spent the bulk of his career exploring the nether reaches of music, yet always with a soulful rock ‘n roll flair. Willy bounced from city to city and record label to record label over the years while battling his heroin addiction. Somehow through it all he put out one wonderful record after another. “Cabretta” produced by Jack Nitzche and released in 1977 was a what brought him to Buffalo in 1978, “Spanish Stroll” was the European pick off that album, and the cover of Moon Martin’s song “Cadillac Walk” it a true gem. Although Willy had many great albums, “Le Chat Bleu” – with his first wife (and my cat’s namesake) Toots on the cover was an album that could be considered almost perfect, there isn’t a bad song in the bunch. Willy was able to co-write with one of his mentors, Doc Pomus on that album and you can feel the Drifters come through. He later released “Backstreets of Desire” with an absolutely amazing version of “Hey Joe”. If you have never heard it, you MUST listen to it. 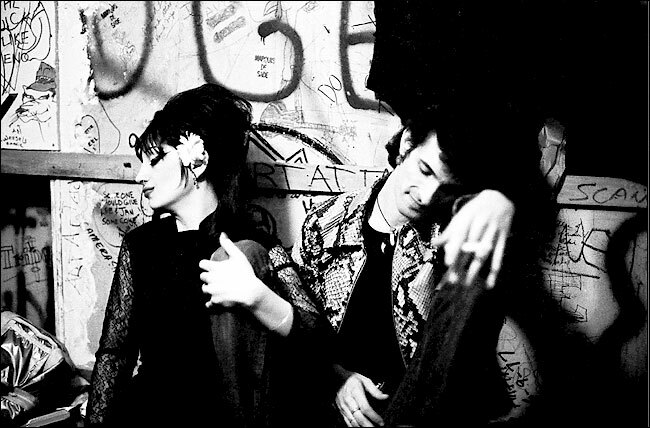 Although Willy DeVille started out with the Ramones, Patti Smith, Television, Blondie, and the Talking Heads at CBGBs – he never achieved the notoriety that they did, he did however outlast them all in creativity. Constantly producing and always reaching a new pinnacle in each genre that he explored. The only thing that keeps me from weeping over his death is the fact that he left us such a huge catalog of wonderful music. Our friend Jim the Vietnam Vet who wrote Jim's Story sent us this great email today and it deserves to be posted and noticed world wide. Ed Freeman was one of the bravest of men this country will ever see. Thanks so much for sending this Jim. You’re an 19 year old kid. You’re critically wounded, and dying in the jungle in the Ia Drang Valley, 11-14-1965, LZ X-ray, Vietnam. Your infantry unit is outnumbered 8–1, and the enemy fire is so intense, from 100 or 200 yards away, that your own Infantry Commander has ordered the MediVac helicopters to stop coming in. You’re lying there, listening to the enemy machine guns, and you know you’re not getting out. Your family is half way around the world—12,000 miles away—and you’ll never see them again. As the world starts to fade in and out, you know this is the day. Then, over the machine gun noise, you faintly hear that sound of helicopter, and you look up to see an un-armed Huey, but it doesn't seem real, because no Medi-Vac markings are on it. And, he kept coming back…13 more times…and took about 30 of you and your buddies out, who would never have gotten out. 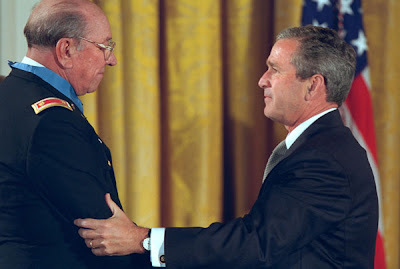 Medal of Honor Recipient, Ed W. "Too Tall" Freeman (November 20, 1927 - August 20, 2008) May God rest his soul. Since the Media didn't give him the coverage he deserves send this to ever red blooded American you know. THANKS AGAIN ED FOR WHAT YOU DID FOR OUR COUNTRY. Just met the owner of the very cool MOTORCITY MUSIC FACTORY the charming Tom Lubinski. 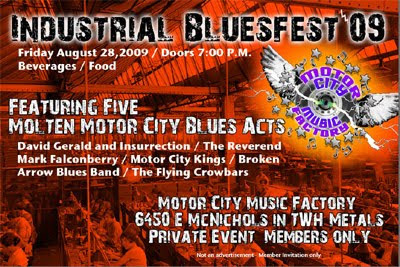 The Motor City Music Factory is a members only (you can join) music venue housed within the industrial expanses of TWH metals complex in Detroit, Michigan. Machinegun and I had big fun hanging out with the friends at there two weeks ago. This factory is a huge venue for music and video production. I went there to scope out the facility for future Machinegun Thompson Projects and to see how cool this place might be. I had heard the week before that it was fantastic out there and it really is a terrific place to film, rehearse, and throw a giant 100,000 square foot party! The kind of events Kimmer likes to throw for sure! We ran into our friend Richard Peardon the fantastic graphic artist that does all those cool Circus Boy posters and much more. Here is a poster Richard did that I love. Just love the Retro feel of Richard's fantastic graphics. His work made me go track down this artist and meet him at the Scott Morgan and the Rationals Cd Release concert a few weeks ago. Machinegun and I ran into Mike the lead singer of Circus boy at Christopher Coppola's PAH Nation Motown festival last month at Madonna University. Machinegun was a featured panelist on the Creativity Panel. 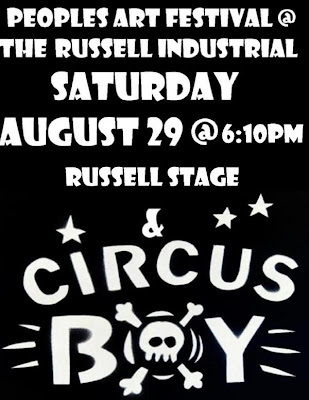 Circus Boy is playing during the People's Art Festival as well as 79 other bands. 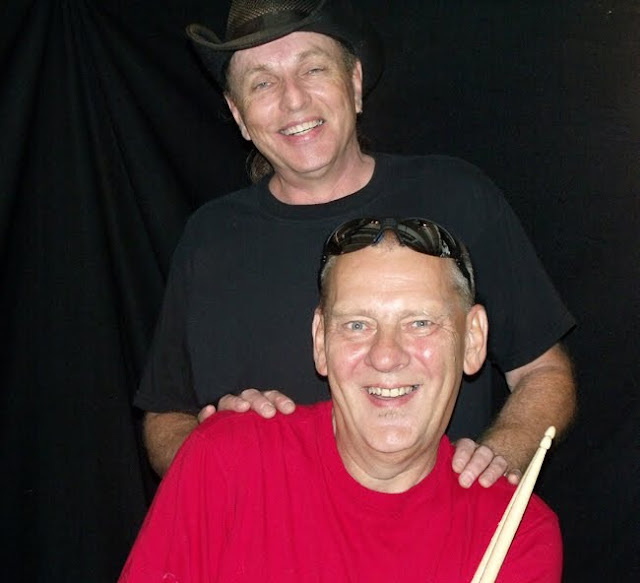 Richard is very busy working with Detroit Wheels Drummer/Artist Johnny Bee Badanjek in the area summer Art Festivals. 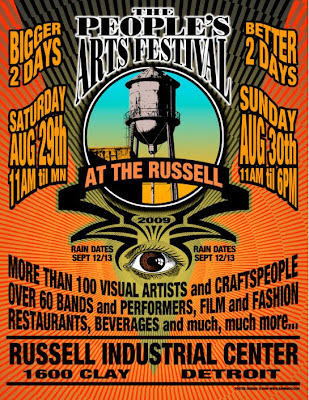 Bee will be displaying his work at the People's Art Festival happening next weekend. 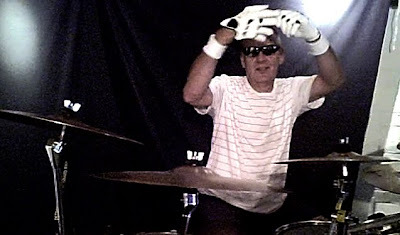 Yesterday I finally filmed Legendary drummer Dennis "Machinegun" Thompson live at his friend Jim Randolph's (One Kiss One Bite) studio. It was very tough going for me as I am really new to digital photography and filming digital video. I had 2 cameras set up on tripods. I have a very cool RCA Traveler and a Fujifilm 10mgp camera that does video too. Not to mention that I have been trying to get a good MGT action video since February...... it was worth the wait. The RCA Traveler did the best job but professional filming is always better. However, using a professional is expensive and you are at their mercy as to when they get the finished product back to you. 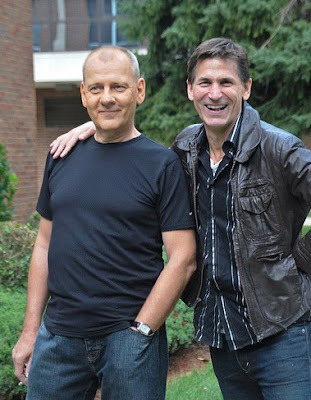 Jimmy's great friend Ron Taylor of Ramtrak Guitars is a big techno geek like the Kimmer. Ron came over and gave me some quick instruction on using my new toys. Jimmy and Ron set up the tripods and helped me catch up with them. Thanks so much Jimmy and Ron!! MGT did a drum tutorial and then jammed a bit with Jimmy. As we were getting ready to start filming MGT had his shades on so we couldn't see his eyes. Jimmy strapped on his guitar and was standing there waiting for MGT to let him know when to begin. MGT launches a slow jazzy kinda thing and Jim looks at me like a DEER IN THE HEADLIGHTS LOL like what am I supposed to do? (As if I WOULD KNOW???) Too funny, so finally Jimmy jumps in with 1 2 3 and joins in and I loved watching and hearing them together. Kimmer had a bunch of fun last Thursday night finally meeting Kirk from the Motorcity Blog and his very talented graphic designer/artist friend RebeccaMich at the Magic Stick in Detroit. We were there to begin the structure of Machinegun Thompson's Houseparty a new show beginning in the fall of 2009. 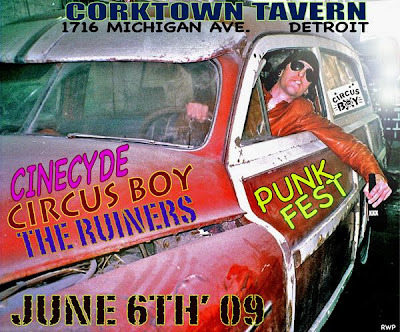 We will feature Machinegun's favorite young local musicians, performance art, Q&A and of course the machinegun himself. Stay tuned for more info on that date when I get that locked in. We have this fabulously handsome friend in Hawaii who moved away 33 years ago. I always wondered where he was and how he was doing in his life. He is charming and a very smart business guy as well. Thanks to the internet and Facebook I found him one night and am so happy to see how great his life is going. 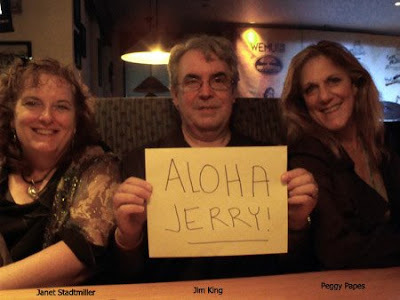 He has a beautiful family and I decided to get some of his friends to send a little Ypsilanti Aloha off to Jerry from Ann Arbor, MI to Hawaii! Last night I took a little journey in my retro past and had a fabulous time! 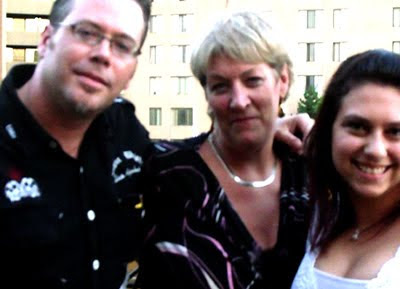 Janet Stadtmiller found me on Facebook and though she was mainly friends with my cousin Leslie, we met at a club to see her first true love fantastic keyboard player Jim King play with his current band Driving Sideways. Jim owns King's Keyboard House in Ann Arbor so run out there a grab a keyboard! 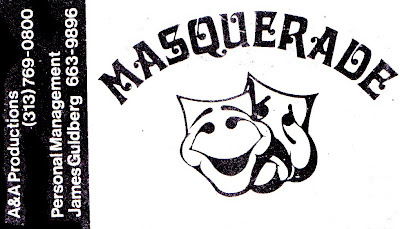 Jim started the band Masquerade back in the 70's when we were all teenagers hanging out with the band. 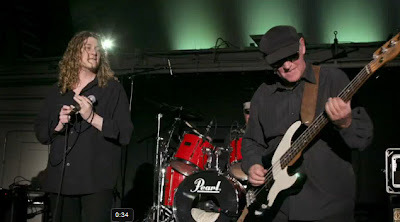 Jim was my personal favorite of the band even though my first true love was Rich Nisbet the bass player. Jimmy sang and played piano/organ/etc. He sang the best of them all. Sorry guys... Jimmy did sing the best. Beth Soraruf came out and Peggy Papes too! I had a blast dancing with the girls and 2 stepping with Peggy to country songs. Been a few decades since the Urban Cowboy days! Where's John Travolta when you need him? Copied John and Uma on batman twist song too. I love this video but can't embed it so you can watch it HERE MY last post was so popular I thought I kick out a little more! The 1960s was a decade of sweeping change throughout the fashion world generating ideas and images which still appear modern today. Whereas fashion had previously been aimed at a wealthy, mature elite, the tastes and preferences of young people now became important. At the beginning of the decade, the market was dominated by Parisian designers of expensive haute couture garments. Yet the shape of clothes was soon transformed by new ideas emerging from the London pop scene. In Britain, musical taste and styles of dress were closely linked and it was the mod look which first popularised the simple geometric shapes typical of the 1960s. 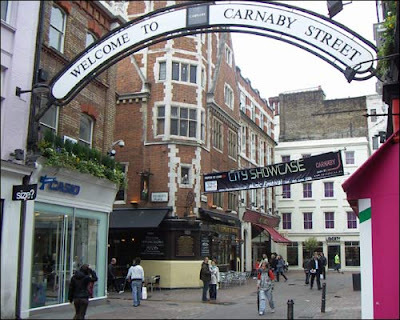 Slim fitting, brightly coloured garments were sold cheaply in boutiques all over 'Swinging London' and had tremendous influence throughout Europe and the US. Later in the decade the hippy look, which originated on the West Coast of America, crossed the Atlantic. This was a time when designers of dress and textiles experimented with colours, patterns and textures borrowed from non-Western cultures. From the start of the 1960s, bands like the Beatles and the Stones, the Kinks and The Who revitalised British pop. Musicians often pioneered alternative ways of dressing, as can be seen from photographs of these bands as they began their careers attired in mod outfits, complete with straight-combed hairstyles. By the latter part of the decade most had swapped these for psychedelic gear, facial hair and a growing interest in music from other continents like India. Important American musical contributions came from Bob Dylan and West Coast groups associated with the folk and hippy movements like the Mamas and the Papas, Peter, Paul and Mary and the Jefferson Airplane. The decade ended with the free festival 'Woodstock' held in a rural part of New York state and headlined by progressive rock musicians such as Jimi Hendrix, Janis Joplin and the Grateful Dead. This was an era when those who wore and photographed clothing for a living could become famous overnight. 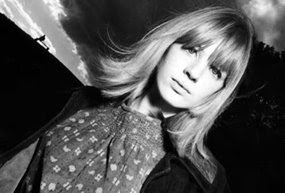 Lesley Hornby, known as 'Twiggy', was a sensation at fifteen years of age when her large eyes, and rake-thin, under-developed figure were hailed as the most extreme version of the mod look. David Bailey and Jean Shrimpton transformed the fashion pages of women's magazines as Bailey snapped Shrimpton in informal poses. Others who photographed top models included John French, Terence Donovan, Brian Duffy and Ron Traeger. They filled the pages of 'Vogue' and 'Elle' with images of Celia Hammond, Penelope Tree, Verushka and Marisa Berenson (the granddaughter of Elsa Schiaparelli). Ideals of beauty became more inclusive as black models like the Americans Donyale Luna and Naomi Sims starred in fashion shoots. 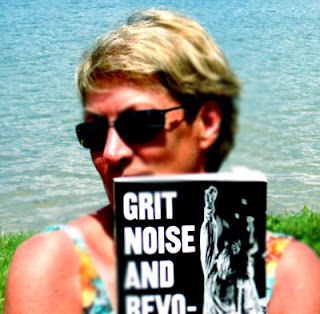 Part one of Kimmer on vacation took us to Silver Lake with three girls and one Machinegun! Someone had to point the camera right? It was a gorgeous day that started out crappy and gray but miraculously turned sunny when we arrived at the beach. Had a wonderful time on the grass beach and had a blast playing with my brand new Fuji digital camera. Lucky for the that really nasty guy running the snack bar that we were all in a chilly mood. He was such a jerk just like the soup guy on Seinfeld. HE needs to get a job serving the chow at a local prison. Hope they revoke his green card soon.